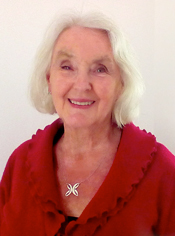 Rashmi began practicing the Siddha Yoga teachings in 1982. She is a Siddha Yoga meditation teacher and speaker for teaching and learning events. Rashmi and her husband, Dharmadas, have hosted a Siddha Yoga meditation center in their home in Lampeter, Wales, since 1983. Rashmi currently offers seva as a writer in the SYDA Foundation Content Department. She has previously served as a Trustee on the Siddha Yoga United Kingdom Board of Directors and as a member of the SYD UK National Steering Committee. Rashmi also served on staff at Shree Muktananda Ashram and in Gurudev Siddha Peeth in the 1990s. Rashmi has a master’s degree in creative writing from the University of Wales. For the last forty-three years, she has owned and operated a health food shop in Lampeter, in partnership with her husband and daughter, Stella. Rashmi has three children and two grandchildren. What an example of perseverance! I reflected on how this story relates to my sadhana. I perform arati every morning, but after reading this story I was inspired to perform it with greater care, intention, and devotion; to pray to Gurumayi and honor her with the same reverence that Madhava extended to Mahalakshmi. The next morning I did not change anything in my outer performance of the arati, but on the inside I invoked a more profound feeling of worship. And it was so sweet! I realized that on the Siddha Yoga path, a slight change in perception and feeling can give rise to a profound experience. I love these subtle changes; they taste like nectar. I am so grateful for this inspiring story. Reading this story reminded me of an experience with Mahalakshmi that I had in the Siddha Yoga Meditation Center in Los Angeles. In one of the halls there is a beautiful life-size wooden statue of Mahalakshmi. I was in the hall with my family and I was worrying about our finances. I turned to Lakshmi, thinking with reproach, "You are meant to be taking care of us." Instantly, an infinite field of gleaming, colorful gems stretched out before my eyes. And I heard within me, "It is the inner wealth. It is the inner wealth. It is the inner wealth." I sank into the profound stillness of my heart. Now, years later, I weep in gratitude as I realize the blessing of my ever expanding awareness of the Truth. Indeed, my family has never suffered lack in our simple, but inwardly rich, life of sadhana. This is the fruit of Mahalakshmi's blessing and Gurumayi's grace. When I first read this beautiful story, I was surprised to realize how much I had been experiencing Mahalakshmi throughout my day. The first sign was a stunning sunrise that cast a rose-pink glow across the clouds and transformed a rainbow into an astonishing arc of pink light. I knew at the time, this was an auspicious sign. Later in the day, as I took a walk in the countryside near my home, I was deeply conscious of the beauty in what I was seeing. It was easy to see beauty in the autumn colors of the trees, but today I discovered beauty even in creatures I have previously found unattractive, such as an old crow, perched on barbed wire, and a brown rat emerging from a stream. As I reflected more on this tale about Mahalakshmi, I knew that beauty exists in everything. I understood how my own perception of beauty had deepened and become subtler, thanks to the Siddha Yoga path. And I felt my heart expand with love and gratitude. I chant your name from a palm-leaf manuscript. The wind sings it back to me from every golden leaf in autumn. I love this story so much. I recognized myself in Madhava, in how I have prayed for so many things over the years. Some things were granted and I could sometimes see a gift bestowed. Some things were not granted, no matter how often I prayed for them. With hindsight, I see how these "prayers denied" were blessings in disguise. Little by little, the things I pray for—and how I pray—have changed. Over time, being connected to the grace-bestowing power of the Guru is polishing my heart, my habits, and my state. As I read this story, I can identify some recent moments of clarity when my heart has been suffused with peace and a shining stillness. This story helps me to see how this is a state free of grasping. That is the space I want to live in. And I see that even the act of praying with focus, time, and humility is a gift and an end in itself. As always, the timing of this story has been a boon. As I read the story of Madhava, my heart expanded. I could actually feel a movement in my heart, and joy along with tears. I felt that I had had an experience of connecting to God, and felt both gratitude and inspiration from Madhava's devotion to Shri Lakshmi. I long for that desire, will, and devotion. What an example! It gives me great hope. Thank you, Gurumayi, for such a wonderful story. What a beautiful story of Madhava's sadhana journey! What I loved in the story was that Madhava learned to appreciate the simple beauty in life—and that’s what the Siddha Yoga path is guiding me toward, especially as I view all the images in the various Nature Galleries each month. So now, the teachings and practices are not confined to just my puja room; they are becoming, for me, a way of life. This story gives me more clarity and confidence on this beautiful path, and appreciation for the simple beauty in life.